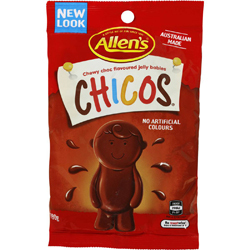 Allens Chicos translates as ‘kids’, however, these lollies are great for all ages. These cute, playful little jelly babies are chocolate flavoured and very moreish. The only way to keep these babies out of trouble is to eat them, making an opened packet hard to put down. One of Allen’s most loved confections that once you have tried you will know why. Allen’s Chicos also 98% fat free. Glucose Syrup (Wheat or Corn), Cane Sugar, Thickener (Dextrin Roasted Starch, Acid treated Starch or Starch Acetate) (Wheat), Invert Syrup, Full Cream Milk Powder, Cocoa, Humectant (Glycerine), Salt, Flavours. These are amazing, very moreish and the smell reminds me of home. Being from England, i don't get to taste many sweets from other countries, unless i order them on the internet. i always try to order something different each time... i until i tried these. AMAZING! my all time favourite. Love to stock up on these when i can, and guaranteed they are always part of my order . just a shame we can't get them over here. For anybody who is a fan of Jelly Babies. These little chocolate treats are amazing! I tried them first when I went to OZ and can not get enough of them! A chocolate-flavoured jelly lolly, you ask? Why, yes, indeed. Chicos take the best of both worlds to create a delicious, chewy, chocolatey jelly baby that literally brings tears of joy to my eyes each time I have one.